So, I just had time to watch another #NTPoC, this one again with Adam Croom; here's the link. Adam starts off by talking about instructor-student negotiation, especially at the beginning of a new course in a field of study that is new to students. He notes that in that moment of newness, there can be a big mismatch of aspiration and readiness: that is such a great topic to address! Not A-Z immediately, but small things you can do, building on what people already do well. I really like that Adam emphasized how that applies both to faculty as course designers AND to students in their learning. I can really relate to what Adam is talking about here since, as a Gen. Ed. instructor, I am teaching classes that are full of "newness" for the students. In the Myth-Folklore class, students might know a bit of Greek mythology but even then not so much (and lots of students enroll in the class thinking it is going to be all Greek myth all the time)... but they often know a LOT about the storytelling that goes on in movies and television, for example, knowing the characters and plots of series like Doctor Who or Supernatural by heart. And hey, Greek "mythos" meant "story" — so it totally works when students find connections between the traditional stories of different cultures and the stories that are familiar to them even now. They often choose projects which build on the familiar and then incorporate the new and unfamiliar, just as Adam mentioned. Building on existing students' strengths and interests and asking them to go somewhere new with that is exactly what the storytelling projects in the class are all about! You can see some Myth-Folklore projects here: Myth-Folklore Storybooks. Last semester, for example, one student did a mash-up of the "Internet dating site" storytelling genre and traditional mermaid legends: MermaidsOnly.com. Something new and something old... blended together wonderfully! In the Indian Epics class, finding those points of connection is harder at first because the epics are really REALLY new to most of the students in the class, and that newness can even be overwhelming. In that sense, it is a more challenging class for me to teach and in a lot of ways I enjoy the India class more because of that, and in this coming year I am so excited that I have a lot of materials to share with the students that I hope will help with that process of familiarization, now having comic books and graphic novels for them to read, audiobooks to listen to, films and videos, music, all kinds of ways to encounter the epics that I hope will pull them in and help them being their own process of exploration, following whatever thread might tug them along. 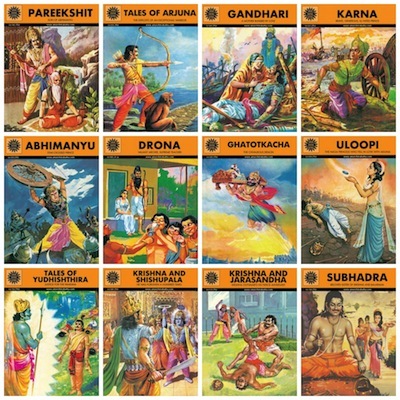 So, THANK YOU to Stacy Zemke and the OER project in our Library that is helping making all of that possible; if you browse through the comic books we will have available in Bizzell Library related to the Ramayana and the Mahabharata, you can get a sense of how cool this is going to be, with so many paths the students might choose to follow! Look at all those Krishnas, and all those happy gopis! Krishna's divine self-multiplication for the gopis is a key moment in Hindu theology... and now the Internet's "multiplicity" allows students to each have their own copy of something: it is a key moment in teaching technology! Let's dance, people! I think if you need your redirection interactable anyway much as could sensibly be normal, you ought to go to Unreal Engine by Epic Corporation. It's a phenomenal piece of programming where everything is basically unequivocal and customers can use whether they have to do it in coding or they have to just move certain segments. I go amazing view in this picture when I open this article I want to visit this place and do photo shoot on it. I don't know about the place that I got details from they wrote about this and alos provide me required details on it. Ok, I started collecting comic books simply a week ago and I am so confused. All I have done is gotten three Batman comics. Batman Detective Comics #6, #7, and number #8. Soon the barcode, they say. April 2012, May 2012, and June 2012. I believed that comics came out once a week not already a month.